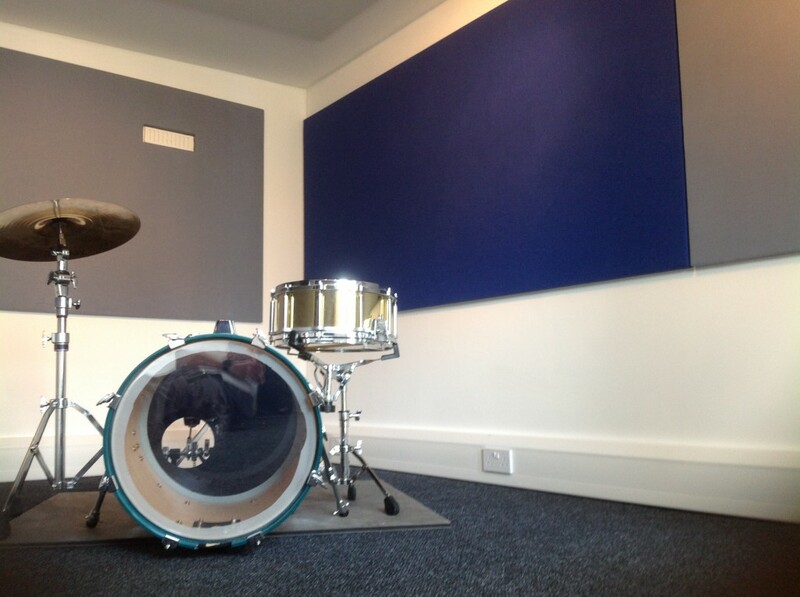 Early in 2013, Amadeus where commissioned by a private customer to design and build an isolated sound proof drum room for instrument practice and tuition. 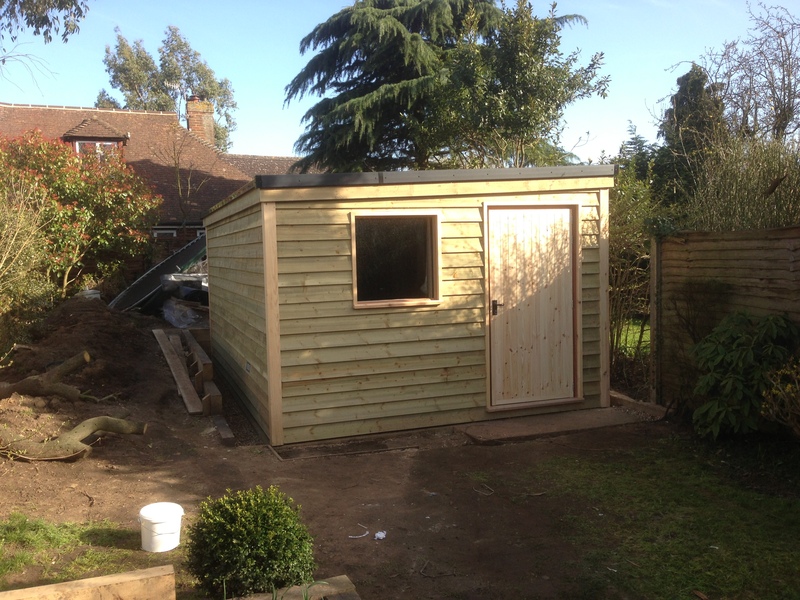 The room needed to include Acoustic Doors, a Recording Studio Window and Acoustic Absorbtion Panels, and it needed to be built in the garden. Here is a peek at the finished drum room from the outside, in a residential garden. And here is a snapshot of the finished room from the inside, including acoustic panels. 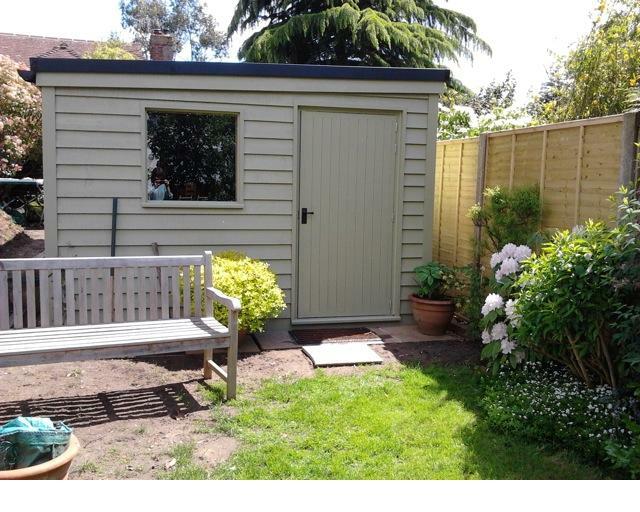 Planning and building regulations played a large role within this project, as local authority stated we could not construct a development higher than 2.5m in the garden, and noise disturbances could interfere with neighboring properties. As the site had large differences with ground levels, excavations and groundwork were first on the agenda. I was later told by the owner that this was once the site of a large air raid shelter built in the Second World War for the local residents; the ground has been high and uneven ever since the shelter’s dismantling many years ago. 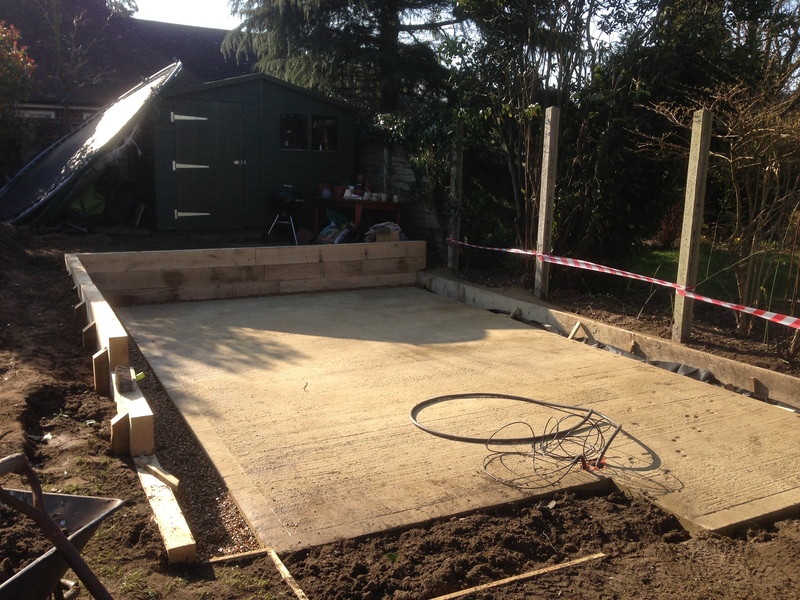 After leveling the area, a concrete base was laid in preparation for the bespoke drum room. 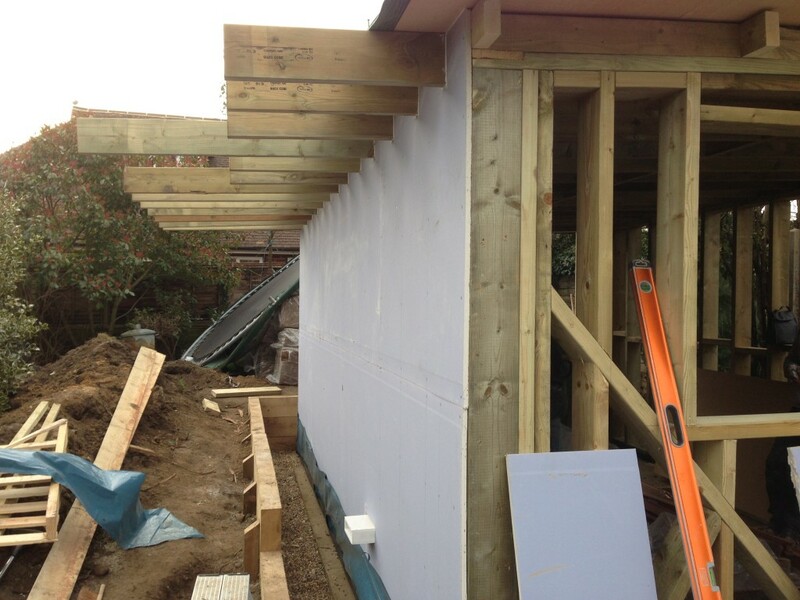 Then a substantial retaining wall was erected to hold back the earth behind and to help redirect the drainage from around the new building. 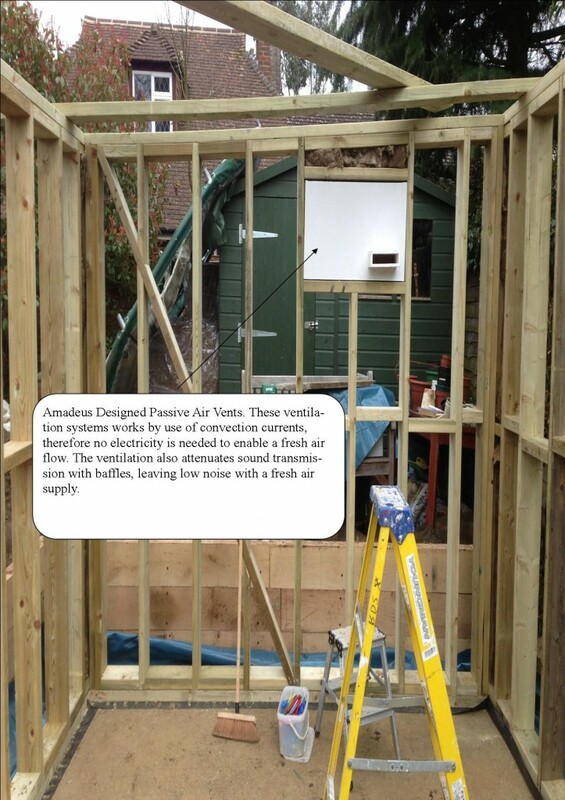 After this the main timber frame could be erected, this is the skeleton of the building and provides strength and structural integrity. As soon as the carcass is finished, the skin can go on, as shown in the picture below. 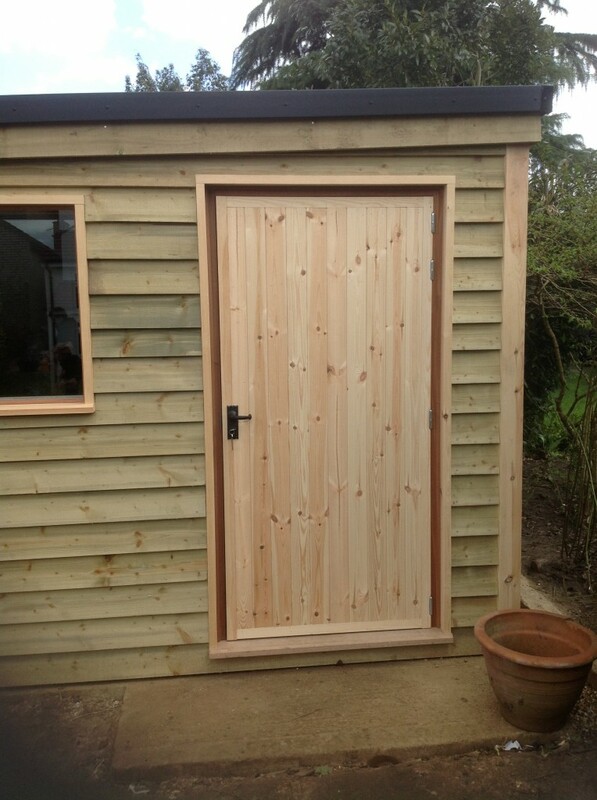 After this, the external weatherboarding can be installed. This design feature is in keeping with a more traditional style of construction and is sympathetic towards the new building’s older surroundings. There are many differing finishes to choose from and Amadeus will meet any aesthetic requirements a client wishes to uphold. 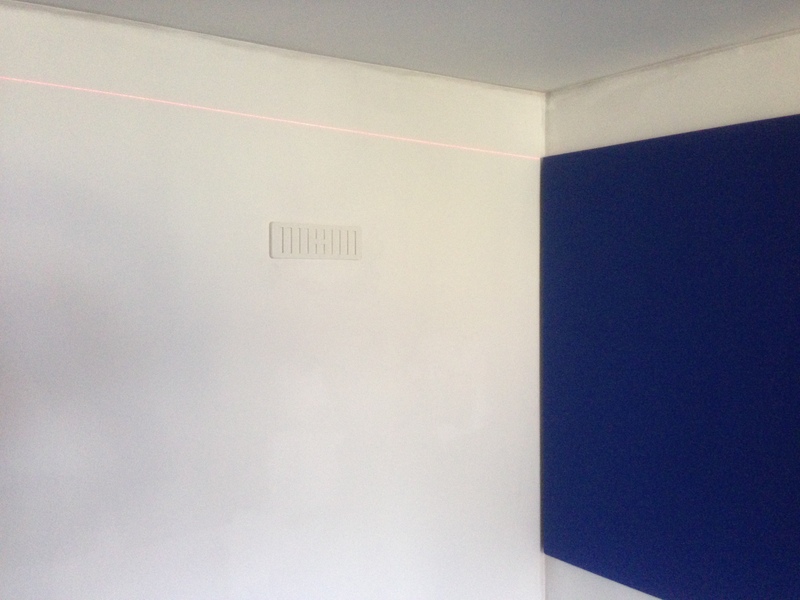 Due to space limitations and noise restrictions, our biggest problem was being able to include enough sound limiting materials to make the sound reduction sufficient, whilst retaining enough internal space for comfort of playing and intended room usage. 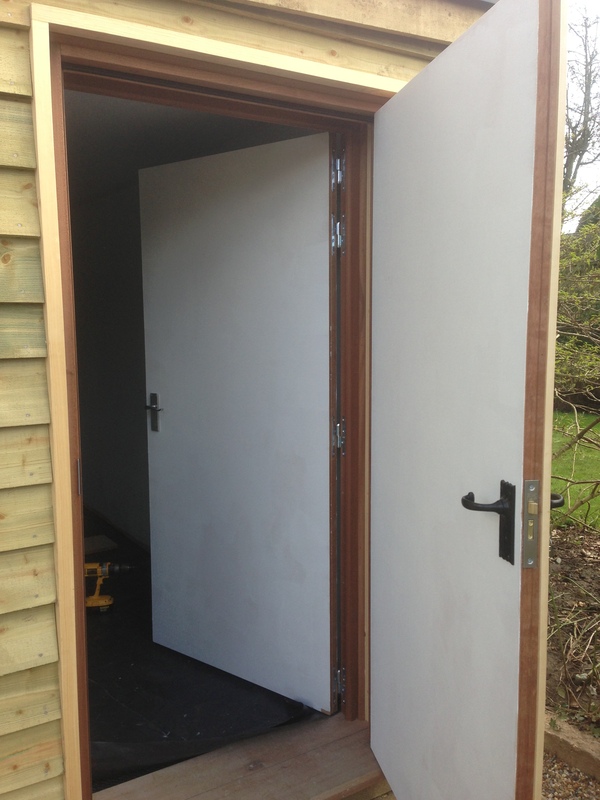 We decided that a double “air lock” style door would be an integral part of the design; several pictures of this are shown below. An Amadeus designed recording studio window was a particularly important inclusion. 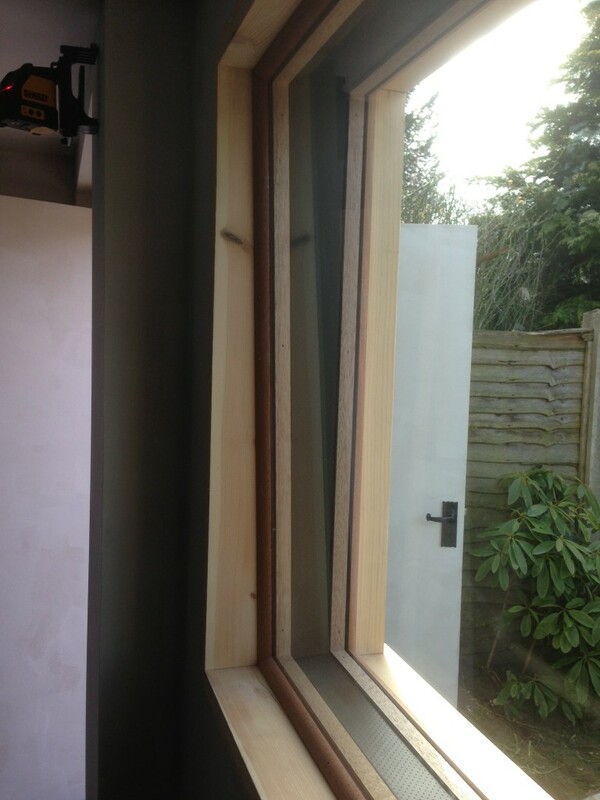 This feature allows natural light to enter the room but still maintains the sound reduction transmission specified for this project. 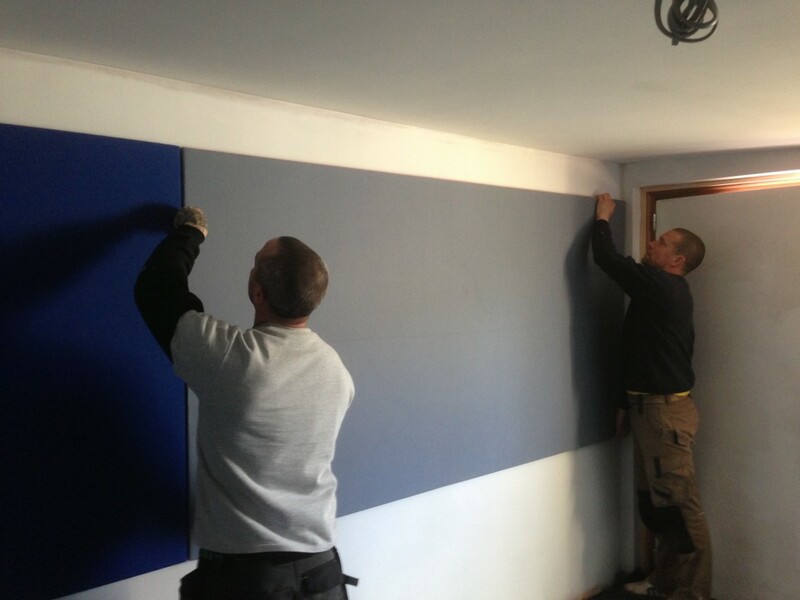 After the main construction had been completed, all that was left to do was plaster the walls, paint the room and install the acoustic panels. Laser levels at the ready! In just under 10 days the Amadeus team constructed a fully operational music rehearsal space that was being used before the paint was dry! Another happy client. 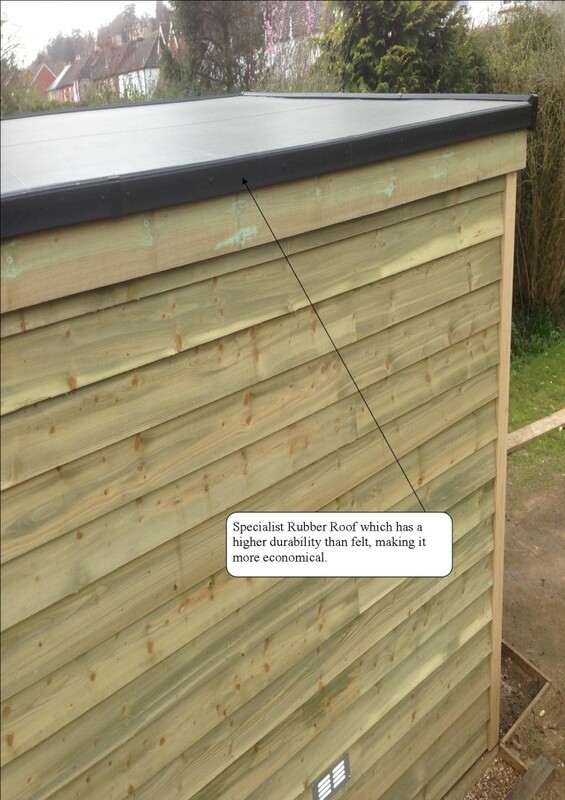 Many thanks to Mike, Lorna and family for featuring in our Case Study. 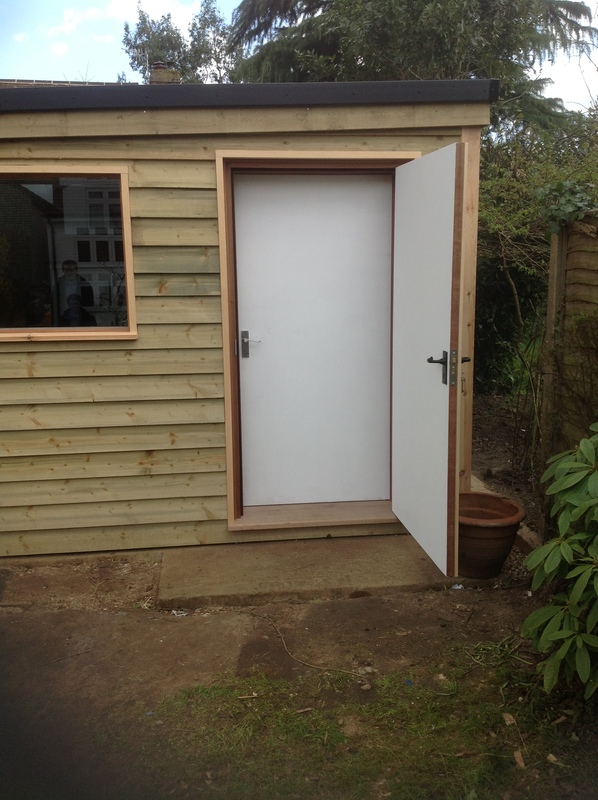 I wanted to write to thank you for everything in making Mike's new drum room happen. I would highly recommend Amadeus to anyone. Especially appreciate you all taking on board what this room means to Mike and I, and making sure that both the process and the product were personalised to our needs. The whole thing was done with great professionalism, skill and enthusiasm - a refreshingly positive experience all round. Many many thanks.